Prior to the implementation of K-12, Statistics was taught in public high schools in the Philippines typically in the last quarter of third year. In private schools, Statistics was taught as either an elective, or a required but separate subject outside of regular Math classes. In college, Statistics was taught practically to everyone either as a three unit or six unit course. All college students had to take at least three to six units of a Math course, and would typically “endure” a Statistics course to graduate. Teachers who taught these Statistics classes, whether in high school or in college, would typically be Math teachers, who may not necessarily have had formal training in Statistics. They were selected out of the understanding (or misunderstanding) that Statistics is Math. Statistics does depend on and uses a lot of Math, but so do many disciplines, e.g. engineering, physics, accounting, chemistry, computer science. But Statistics is not Math, not even a branch of Math. Hardly would one think that accounting is a branch of mathematics simply because it does a lot of calculations. An accountant would also not describe himself as a mathematician. Math largely involves a deterministic way of thinking and the way Math is taught in schools leads learners into a deterministic way of examining the world around them. Statistics, on the other hand, is by and large dealing with uncertainty. Statistics uses inductive thinking (from specifics to generalities), while Math uses deduction (from the general to the specific). Statistics deals with data; its importance has been recognized by governments, by the private sector, and across disciplines because of the need for evidence-based decision making. It has become even more important in the past few years, now that more and more data is being collected, stored, analyzed and re-analyzed. From the time when humanity first walked the face of the earth until 2003, we created as much as 5 exabytes of data (1 exabyte being a billion “gigabytes”). Information communications technology (ICT) tools have provided us the means to transmit and exchange data much faster, whether these data are in the form of sound, text, visual images, signals or any other form or any combination of those forms using desktops, laptops, tablets, mobile phones, and other gadgets with the use of the internet, social media (facebook, twitter). With the data deluge arising from using ICT tools, as of 2012, as much as 5 exabytes were being created every two days (the amount of data created from the beginning of history up to 2003); a year later, this same amount of data was now being created every ten minutes. 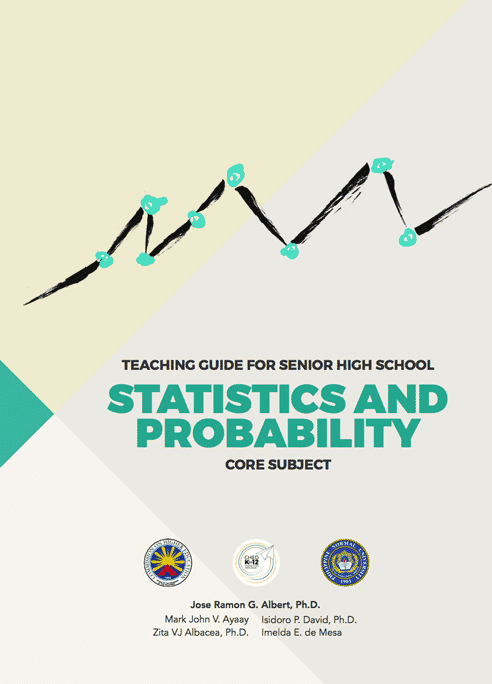 This teaching guide, prepared by a team of professional statisticians and educators, aims to assist Senior High School teachers of the Grade 11 second semester course in Statistics and Probability so that they can help Senior High School students discover the fun in describing data, and in exploring the stories behind the data. The K-12 curriculum provides for concepts in Statistics and Probability to be taught from Grade 1 up to Grade 8, and in Grade 10, but the depth at which learners absorb these concepts may need reinforcement. Thus, the first chapter of this guide discusses basic tools (such as summary measures and graphs) for describing data. While Probability may have been discussed prior to Grade 11, it is also discussed in Chapter 2, as a prelude to defining Random Variables and their Distributions. The next chapter discusses Sampling and Sampling Distributions, which bridges Descriptive Statistics and Inferential Statistics. The latter is started in Chapter 4, in Estimation, and further discussed in Chapter 5 (which deals with Tests of Hypothesis). The final chapter discusses Regression and Correlation. Although Statistics and Probability may be tangential to the primary training of many if not all Senior High School teachers of Statistics and Probability, it will be of benefit for them to see why this course is important to teach. After all, if the teachers themselves do not find meaning in the course, neither will the students. Work developing this set of teaching materials has been supported by the Commission on Higher Education under a Materials Development Sub-project of the K-12 Transition Project. These materials will also be shared with Department of Education. Writers of this teaching guide recognize that few Senior High School teachers would have formal training or applied experience with statistical concepts. Thus, the guide gives concrete suggestions on classroom activities that can illustrate the wide range of processes behind data collection and data analysis. It would be ideal to use technology (i.e. computers) as a means to help teachers and students with computations; hence, the guide also provides suggestions in case the class may have access to a computer room (particularly the use of spreadsheet applications like Microsoft Excel). It would be unproductive for teachers and students to spend too much time working on formulas, and checking computation errors at the expense of gaining knowledge and insights about the concepts behind the formulas. The guide gives a mixture of lectures and activities, (the latter include actual collection and analysis of data). It tries to follow suggestions of the Guidelines for Assessment and Instruction in Statistics Education (GAISE) Project of the American Statistical Association to go beyond lecture methods, and instead exercise conceptual learning, use active learning strategies and focus on real data. The guide suggests what material is optional as there is really a lot of material that could be taught, but too little time. Teachers will have to find a way of recognizing that diverse needs of students with variable abilities and interests. This teaching guide for Statistics and Probability, to be made available both digitally and in print to senior high school teachers, shall provide Senior High School teachers of Statistics and Probability with much-needed support as the country’s basic education system transitions into the K-12 curriculum. It is earnestly hoped that Senior High School teachers of Grade 11 Statistics and Probability can direct students into examining the context of data, identifying the consequences and implications of stories behind Statistics and Probability, thus becoming critical consumers of information. It is further hoped that the competencies gained by students in this course will help them become more statistical literate, and more prepared for whatever employment choices (and higher education specializations) given that employers are recognizing the importance of having their employee know skills on data management and analysis in this very data-centric world. may TG na po ba kayo ng stat and probability?? pasuyo po ng TG.. pakisend nalang po sa email.. thanks a lot..
sir where can i download the TG for statistics and probability? Malakingb tulong po sakin ang mga tg po dito, sana po magkaroon po ng tg sa marketing at entrepreneurship po at organization management po, salamat po. This folder doesn’t exist or you no longer have permission to access it.>paano po ma.access ang teaching guides sa statistics? Good Morning po sir, pwede bang humingi ng teaching guide at learning guide ng Statistics and Probability. Kailangan ko talaga kasi may demonstration kami sa school next week or this week. I cant download the file. Why is it? Empty folder pa din po ang stat..
Bakit wala pang statistics and probability na pdf? Good morning po. How to download a copy of Statistics and Probability? d po madl the folder doesn’t exist daw po. meron po bang ipang paraan para madl. paano po to ma.download sir??? sir, bat empty po yung folder ng stat and probability?Pano po ba yan madownload ulit?I need it po.Thank you po! good pm po can i have a copy of statistics and probability tearhers guide please….. send into my email plz…. here’s hoping for a downloadable copy of probability and statistics tg soon… thank you and God bless you, sir. Good evening po. May I have a copy of Statistics and Probability? hi sir good afternoon. empty folder daw po. pano po kami mkakapagdownload? Please send me the TG and LM .Stat and Prob. Sir, pasend naman copy nito, di po madownload. Many thanks & Godbless po. As of Today, July 23, 2016 the Folder is empty…. Good day Sir….. Until now ,the folder is empty. Empty folder po ang stat. pls update thanks. Empty folder po ang stat. pls update thank u po. its an empty folder. Sir how do I can a copy. Can’t download. thanks sir. Good Day could you please upload the file again… it says in the google drive that your files is in the source’s trash… thank you and more power! Hello sir Good Day please fix the download the source file is empty… thank you very much for your time and effort. request daw po from gerson abesamis kc nasa trash na.